Description of "What is Happiness? 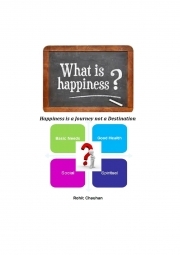 (eBook)"
Happiness is a Journey not a Destination. In this book we have tried to answer the question what is happiness? in practical scenario we live today. Most people link happiness with Spirituality or philosophy but we will discuss something different in this book. This book discuss about the bottom line requirement of all we do in day to day life. Reviews of "What is Happiness? (eBook)"